Manila, Philippines - State weather bureau PAGASA on its eleventh update as of July 21, 2014 (11:00p.m.) said that Typhoon 'Henry' (international name: Matmo) has maintained its strength and direction as it continues to move towards extreme North Luzon. At 10:00 PM today, the eye of Typhoon “Henry” was located based on all available data at 340 km East of Aparri, Cagayan or 340 km Southeast of Basco, Batanes (18.9°N, 125.0°E). 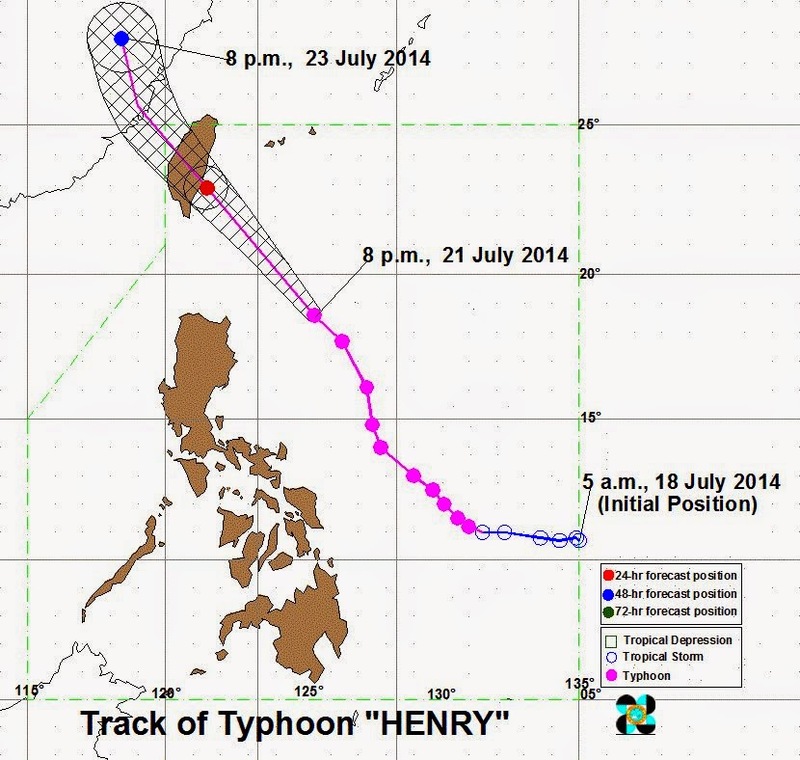 'Henry' has maximum sustained winds of 130 kph near the center and gustiness of up to 160 kph. It is forecast to move Northwest at 24 kph. Typhoon “HENRY” is expected to be at 270 km North of Basco, Batanes by tomorrow evening (July 22). By Wednesday morning (July 23), it is expected to be outside the Philippine Area of Responsibility (PAR) and at 820 km North Northwest of Basco, Batanes by Wednesday evening. Public Storm Warning Signal #2 (Winds of 61-100 kph is expected in at least 24 hrs): Batanes Group of Islands. Public Storm Warning Signal #1 (Winds of 30-60 kph is expected in at least 36 hours): Cagayan including Babuyan and Calayan Group of Islands. The estimated rainfall amount is from 7.5 – 15 mm per hour (moderate - heavy) within the 500 km diameter of the Typhoon. Typhoon 'Henry' and the enhanced Southwest Monsoon or “Habagat” are expected to bring moderate to occasionally heavy rains and thunderstorms over Cagayan Valley, CALABARZON, MIMAROPA, Bicol Region and Western Visayas. Residents in these areas are advised to be alert against possible flashfloods and landslides. Fisherfolks and those with small seacrafts are advised not to venture out over the eastern, southern and western seaboards of Luzon and the seaboards of Visayas.